By all accounts, 2018 was a game-changing year for rail with record-shattering volumes in intermodal along with carload records for chemicals, crushed stone, sand and gravel. Total combined traffic for the whole of 2018 was up 3.5% year-over-year. But a slight 0.69% drop in overall rail volume in December offered a reality check as the year closed. U.S. railroads originated 1.02 million carloads and 1.01 million intermodal units in December, making for the second month of decline after November, which marked the first down-tick in nine months for carloads. The drop is due largely to a nearly 1% decline in carloads and, less so, a 0.43% decline in intermodal shipments year-over-year. Most of the dip in carloads is due to the declining coal industry. Without coal shipments, overall carloads were up 2.5% in December year-over-year. 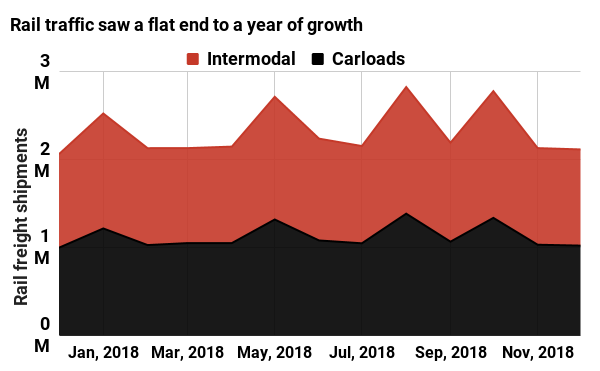 After intermodal rail traffic peaked for the fifth time in six years in October, railroads started to wonder whether intermodal traffic was moving into a new normal of strong growth. In December, AAR Senior Vice President John Gray said the dip might be a one-off, but he warned economic factors could also be at work. December’s figures aren’t necessarily predictive but do indicate stakeholders ought to heed Gray’s advice and keep an eye on the overall economy, as intermodal traffic is clearly not immune to its swings. With trucking capacity showing some signs of recovering and continued machinations around trade in Washington, explosive intermodal growth is looking slightly less certain today that it was two months ago. “What happens in 2019 will depend on how the domestic and global economies hold up and the policies – particularly monetary and trade – that come out of our legislative and executive branches,” said AAR Senior Vice President of Policy and Economics John T. Gray in a statement.